The first St Joseph’s School was opened on the 21st January, 1884, by the Sisters of St Joseph of the Sacred Heart. This was initially for day pupils, although boarding facilities were provided soon after. The original school was a wooden building erected next to the church. When the new church (the existing one) was built in 1909, the school moved into the old church building. Over the years other buildings were added as the population of the town increased and, more specifically, numbers at St Joseph. A two-storey block was completed in 1926 and an Infants’ building was erected in 1960. However, the 60’s brought many changes to education in New South Wales. The Wyndham Scheme meant a re-structuring of educational practices employed in the schools, especially in secondary areas. In order to cater for a wider curriculum a Science Block was added in 1965. This was to be the forerunner in the evolution of a separate Secondary School – St Joseph’s College, which opened in 1969. The College was extended in 1974 when a new Craft/Woodwork room was built. The first lay teachers were employed during the 1960’s. The boarding school, which was such an integral part of St Joseph’s finally closed in 1978. In 1979 it was decided to expand the facilities of both St Joseph’s College and St Joseph’s Primary School with the erection of a new Science Block within the College grounds and the remodelling of the old Science Block to provide a new Kindergarten room, which opened in 1980. In 1988 a new era of Catholic Education began when, after two years of intensive planning and consultation, the College and Primary school once again amalgamated to form a single school catering for boys and girls from Kindergarten to Year Ten. Since then the school has operated as a K‑10 school under the one central administration. Kindergarten to Year 5 are housed in the original Primary School building (Tenison block) while 6 to 10 occupy the College premises (MacKillop block). In 1990 an Art Room was added to the complex and in 1997 extensions were completed to the existing Technics building. Over the years parts of the Convent building have also been used for some specialist subject areas, e.g. Art, Computers, Food Technology and Textiles & Design. From 1998 all school activities now take place in the school buildings, except Food Technology which uses TAFE facilities. The Sisters of St Joseph maintained their presence in the school from 1884 to 1995, when declining numbers and commitment to other ministries forced them to withdraw. However, the traditions and ideals built up during that time still prevail. The original enrolment was approximately 30 students, today St Joseph’s has an enrolment of 210. The following excerpt taken from “St Patrick’s Parish, Glen Innes 1871-1996” a souvenir to mark the 125 anniversary of the Glen Innes parish. On 15th January, 1884 Fr. Marianus and a large number of leading parishioners assembled at Glencoe and escorted the day coach to town. The passengers were Bishop Torreggiani and three Sisters of St. Joseph ~ Sr. Magdalen, Sr. Agatha and Sr. Denis. On arrival at the convent they were met by another group who welcomed them to Glen Innes with great warmth and practical hospitality. On Sunday 20th January the Bishop solemnly opened and dedicated the convent and the Sisters began teaching Sunday School. St. Joseph’s School was opened the following day. It wasn’t long before the boarding school began. The convent had closed in verandahs and these were used as sleeping apartments. Dean Mitchell who followed Fr. Marianus as parish priest, had erected a large wooden building to provide accommodation for the increasing number of children. This building was beside the stone church and served its purpose for many years. It was finally demolished to make way for the new infants school which was opened on 18 September, 1960. After the building of the new church in 1909, the stone church was used as a school, together with the wooden additions. Steadily the student numbers increased. By 1912 there were forty five to fifty boarders. The convent was also the Pro­vincial House of the Order. 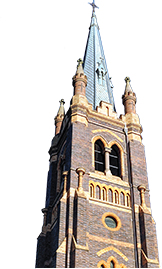 The General Chapter of the Sisters in 1899 declared Armidale and Lismore as a separate Province appointing Sr. Josephine Mary Carolan as the first Provincial. The need for a new and larger convent was obvious. Monsignor Tobin called a public meeting and placed before the parishioner the dilemma that faced them. A resolution was taken to build a new convent. Plans for the new building were prepared by J. F. O’Connor, an architect at Inverell, and the builder was G. F. Nott of Armidale. Monsignor (while he was Administrator in Armidale) had wit­nessed his talents in the building of the Cathedral in Armidale. On 10th July, 1916 the foundation stone of the new convent and boarding school was laid by Bishop O’Connor. It was completed and opened in October, 1917. In the publication “Glen Innes and District Illustrated. The Garden of New England” printed in 1918, it was stated that St. Joseph’s Convent School had an enrolment of 300. Little wonder then was it that Monsignor Tobin next decided to erect a school, a two storey building to be situated between the new convent and the Church and to compliment each of these fine building. The foundation stone was laid on 12th September, 1926 and the building was completed and opened on 30th January, 1927 thus completing a group of ecclesiastical buildings unsurpassed in the area. The small stone church was renovated and fitted up as the first separate infants department in the Catholic School. It was not long after the appointment of Monsignor J. P. O’Connor that he set about the demolition of the wooden structures and the erection of a new infants’ school in their place. The infants department, designed by Terence A. Daly and Associates and costing £26,000 was constructed to the most modern architectural standards. Its particular feature was that it made maximum use of natural warmth and light, with wide areas of glass facing north. The building was blessed and opened by the Vicar General, the Right Reverend Monsignor J. Healy on 18th September, 1960. This allowed the stone building to be vacated and converted into an excellent assembly hall for the school. A kitchen and tuckshop were also added to the building and have proved a valuable acquisition to this day. Keeping abreast with modern trends, Monsignor O’Connor perceived the need for a science laboratory and this was duly erected adjacent to the infants school and of similar design. The structure, which cost £25,000, was blessed by the Bishop of Armidale, the Most Reverend E. J. Doody D.D. on 25th July, 1965. 1966 was a special year for all schools run by the Sisters of St. Joseph, for that year marked the centenary of the Order founded by Mother Mary of the Cross. Here in Glen Innes the occasion was observed with splendid celebrations and great rejoicing. The main activities took place on Saturday, March 19th – the feast of St. Joseph, commencing with a spectacular parade of 800 children and Sisters through the main streets of the town. The Bishop of Armidale (Bishop Doody) celebrated an open air Mass, preached to a crowd of some thousands, and, together with about 30 other local and visiting priests and brothers, was entertained at dinner at St. Joseph’s Convent. Visitors enjoyed a picnic lunch in the assembly hall of the Practice School, the use of which had been made available by the Principal, Mr. R.V. Lennon. The men of the parish served a barbecue to the children in St. Joseph’s grounds. In the afternoon more than 1000 people crowded every inch of the Town Hall for a concert. Several rows of extra seating were brought in and still a big number had to stand. Items were presented by students of the local and all visiting schools. The concert was climaxed by a soul moving presentation at the conclusion which focused attention on the life of Mother Mary and the work of the Sisters of St. Joseph. There was a Mass of Thanksgiving in the Church on Sunday which was attended by the Sisters of St. Joseph while the choir was that of St. Joseph’s School, Glen Innes. On Monday a Requiem Mass was offered in the Church for all de­ceased Sisters of St. Joseph – special reference was made of those who had served in Glen Innes. Thus the centenary was fittingly recognised. 1966 also saw the enrolment at our school to be 440 and it became obvious that the school buildings, in spite of additions, were insufficient to accommodate the growing number of students. Realising a major building programme would have to be undertaken in this regard, it was decided at a meeting in December, 1967 to erect a new secondary school, on church land in Meade Street. This new school was to be entirely separate and conducted independently of the infants and primary departments. The building, again constructed to Mr. Daly’s design, was completed and furnished at a cost of $73,000. It was blessed and opened by Bishop James Freeman on 8th June, 1969. In his address Bishop Freeman said “This building is destined to stand not only as a monument to the initiative of your parish priest and to your own generosity, but also as a major contribution to the educational well-being of generations of Catholic children. “In the meantime, the school we are opening today marks another step forward in the education of the Catholic children of this district. “May the school always produce God-fearing men and women who will be good citizens proving in their lives and their achievements that they are a credit to their religion and their country. As time went on and requirements changed a new Science Block was needed. Plans were drawn upon 17th March, 1977 by John McDonald & Co. from Grafton and tenders were called. The work was carried out at a cost of $100,000 by Hardy Marr Construction. The former science room was renovated and refurnished at a cost of $24,000. It was blessed and officially opened by the parish priest Fr. S. Brennan as a new kindergarten on 25th March, 1981. 1988 saw a new era in Catholic education. A decision was made to amalgamate St. Joseph’s Primary School and St. Joseph’s College into a single school catering for students from Kindergarten to Year 10. St. Lynette Raftery, who had been principal of St. Joseph’s College, was to be the principal of the combined school. She said “While we stand at the threshold of a new venture we have the opportunity to continue the outstanding tradition nurtured over the last one hundred years, of providing an education permeated by Christian values. The concept of a Kindergarten to Year 10 school is one which can provide an exciting and challenging educational facility through its capacity to cater for the educational needs of students from kindergarten to early adulthood. The school continues in this format up to the present time with a group of dedicated and qualified staff. The small class numbers, together with the pastoral care programme, afford the student every opportunity to grow and develop as an integrated person. In 1980, the St. Joseph’s School Board was established. The objective of the Board was to assist the Parish Priest, at that time, Father Steven Brennan, with the daily running, financial administration and future expansion of St. Joseph’s School. The Board consisted of the Parish Priest, Principals of both the Primary and Secondary Sections of St. Joseph’s School, two teacher representatives and elected representatives from the parents. Among the foundation members were, Fr. Brennan, Sister Coral Anne, Bob Thurling, Tony Biddle, Helen Kennedy and Kerry Muir. The School Board fulfilled it’s objective and it provided a forum for discussion often leading to decisive action on school policies. In the early 1980’s Senator Susan Ryan, the then Minister for Education, was personally asked for an increase in funding for non-government schools, by members of the Board. We hope the School Board will continue to play an active and decisive role in Education of Our Young Australians, through St. Joseph’s School. and active from 1980-1987, President, 1982. Mothers Club was first formed at the home of Trish Williams in November, 1978. It was a get together for the mums and children of the 1979 Kindergarten class to be. It continued like this for about 18 months then a trading table was introduced where the proceeds were spent on teach­ing aids and equipment for the school. Today’s Mothers Club follows much the same format with proceeds from catering for carnivals etc., being used to buy books, equipment and com­puter aids for the school. The story of the involvement of parents in the education of their children in this parish, as in all parishes, is as long as the story of education. From the earliest days of the Catholic school parents have been responding to the requests for “Sister” to raise funds for some project or equipment, or to attend a working bee. However it was about 30 years ago, that the parent’s organisation known statewide as The Parents and Friends’ Association came into being in Glen Innes. The purpose of this body then, as now, was to give parents and other interested members of the community an official means to work with the Parish Priest, Principal and staff to improve the school. Initially most of the organisation’s energies were spent in fundraising, and this remains as a most important function. In recent years however, there has been an increasing awareness from educational authorities of the importance of parents as partners in the total education of there children. At local, diocesan and state levels the P. & F. is the recognised parent body for the giving and receiving of information and advice. During the last year members contributed to discussions on the H.S.C. (McGaw inquiry) and the School Entrance Age. The P. & F. is also anxious to promote the school within the community, and annual fundraising events such as the Ambrose Golf Day and the Quiz Night, now firmly established in the local calendar help to do this. The P. & F. has a constitution which states the purpose and the scope of the body. There is an elected executive and meeting.. are held monthly. Although the majority of parents do not attend meetings and become involved with the actual organisation, it is only because the executive can rely on the support and the generosity of the silent majority of parents that they can function successfully.